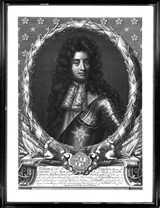 This mezzotint engraving of William, 3rd Duke of Hamilton was made to commemorate his death in 1694 by Peter Vanderbank, a London engraver. It has been in the Hamilton Collection ever since. It is probably one of those printed for the duke�s widow in 1706. The duke is seen in his full-bottomed wig and armour. Round his neck is a lace cravat and he wears both the sash and the star of the Order of the Garter. The engraving may have been done after the 1682 portrait of him by Sir Godfrey Kneller. The son of William Douglas, 1st Marquis of Douglas, the 3rd Duke of Hamilton fought in the royalist army in the mid-1650s and, in 1656 married Anne, 3rd Duchess of Hamilton in her own right. At her request, Charles II made him Duke of Hamilton. In parliament, the duke led the opposition to John, 1st Duke of Lauderdale, later serving twice as Lord High Commissioner. President of the Scottish Privy Council in the 1680s, he occupied other important offices including that of Lord High Admiral and was an extraordinary Lord of Session. Peter Vanderbank (1649-97), a well-known London engraver was probably related to John Vanderbank (1694-1739) the artist. Peter had himself been painted by Sir Godfrey Kneller (1646-1723).